Who doesn’t love a terrible pun? Many people, it turns out. That’s why I’m having to restrain myself from making GAL puns these days. 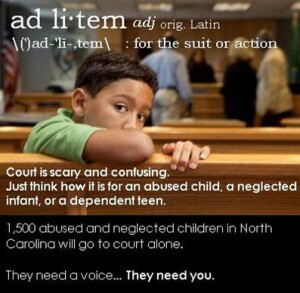 GAL stands for Guardian ad Litem, which is what our state calls volunteers who are trained and appointed by judges to be advocates for children who were abused or neglected, and are now in foster care. In some states, Guardians ad Litem are called CASAs, or Court Appointed Special Advocates. You can read all about what GAL and CASA volunteers do on the national CASA website. As the regular readers of this blog know, our attempts at foster care adoption opened our eyes to the many challenges that children in care face and the need for more advocates of all types both inside and outside of the foster care system. A representative from the GAL office came in to talk with our MAPP class last year and I remember thinking to myself, “These GAL folks are totally the badasses of foster care.” In a system where so much emphasis is put on the rights of biological family and there’s such a large amount of red tape to get through to make change happen, the GAL is able to advocate solely for the child in care. And, as a volunteer, a GAL isn’t beholden to the same people as a social worker or foster parent. The goal of every GAL is permanence for “their” child, whether that be reunification with the child’s birth family or adoption outside of the child’s biological family. Studies have shown that children with GAL/CASA advocates are substantially less likely to be in long-term foster care, they have a higher chance at adoption, and they get more support services while in foster care. Seeing as a large part of our interest in adopting a child from foster care was to give a child a safe, loving, and permanent home, becoming a GAL was right up my alley! So I signed up, was interviewed, completed the training offered through our local GAL office (it’s a challenging course, but doable), and was sworn in last week, and got my first cases yesterday. If the stats on the CASA website ring true for me, I’ll be able to help get far more children in permanent homes as a GAL than if we had simply adopted. As with so many things, it’s all about figuring out where you can do the most good, then getting in and doing it! Quick update: I got the opportunity to talk with a local reporter about being a Guardian ad Litem in hopes of bringing more volunteers to the program. Posted in fun and not-so fun facts, things we've learned, what's all this about?